For a fast free estimate give us a call. All estimates scheduled for next day! If your looking for roofers in Chicago and the Chicagoland area look no more because Urb Chicago Roofing Contractors offer complete roofing solutions and are serving the metro Chicago area and the surrounding counties. Chicago Roofing Contractors provide roof tear offs, new roof installations, as well as roof repairs and installation of gutter guard system to protect your drainage system. Urb Chicago Roofing Contractors install, repair, and service both commercial and residential roofs. Urb Chicago roofing contractors have years of experience in the roofing industry and will provide you with nothing but the highest possible grade materials and great workmanship that can only be done by experienced Chicago roofers that are committed to their work and excellence. Your flat roofing on your home or business can be repaired or replaced by Urb Chicago roofing contractors. Flat roofs have bad reputations but we have been fixing leaking flat roofs for over 20 years. Whether it is a small dormer, and addition to your home, large apartment or commercial building, we have the expertise, quality workmanship and materials to solve your flat roof problems. We install built-up asphalt, gravel, modified bitumen and TPO membranes. We will also be happy to repair your flat roof. At Urb Chicago Roofing contractors we pride ourselves on being able to handle anything our customer’s home needs. Whether your house only needs a few new shingles, or have major storm damage, we are happy to help with all types of home repairs small or large. We are Chicago Roofing Contractors and your premiere source of roofing services in Chicago, Illinois. 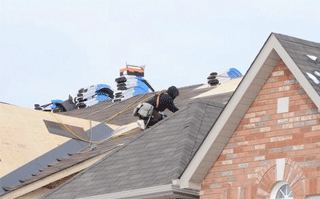 Urb Chicago Roofing Contractors was established several years ago to address roofing issues in the Chicagoland Area. The roofing services that we provide include installation, maintenance, on-site roof inspections, roofing surveys, life-cycle analysis, as well as strategies to extend the life of a roof.